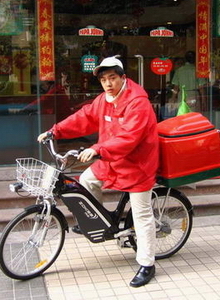 Ev Sales and Service Company (aka EV) was founded in 1999 and has developed into a fully integrated company providing service solutions for clients with business in China thats focus is on local deliveries such as fast food franchises, delivery companies, courier service. EV is the only full service provider for a one stop shop solution for delivery vehicles. Solutions include; preventive maintenance and repair for electrical bicycles, scooters, bicycles, motorcycles, and sidecars. EV is the only supplier in China to provide high quaility delivery boxes and specialized electric vehicles designed for deliveries and commerical use. With owners from overseas, EV's management style and company operations leads the way with a high level of quality service thus satisfying international and corporate client demands and their expectations in a very demanding market in China. Our goal is to provide our clients with top quality service in preventive maintenance and products so that they are able to make deliveries on time and have all their vehicles ready when needed. Proper preventive maintenance delivers customers satisfaction.